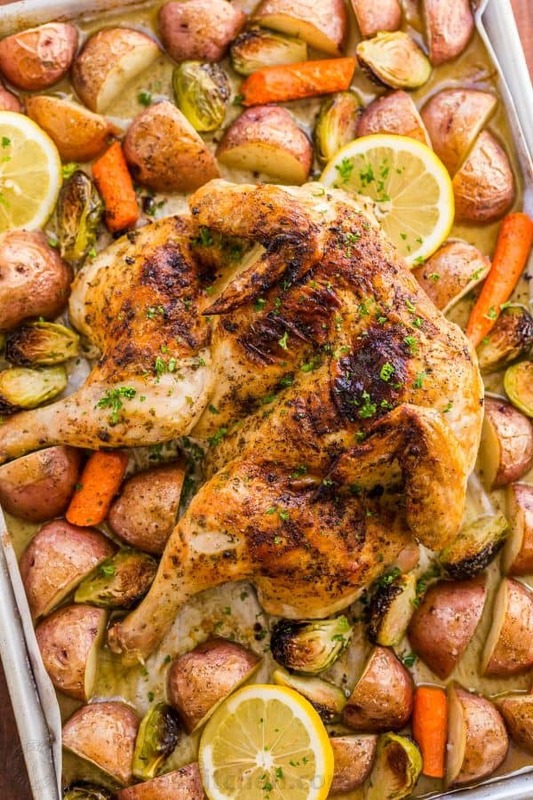 This Spatchcock Chicken recipe is our favorite way to roast a whole chicken. 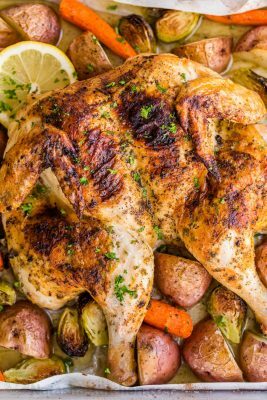 Every part of the roasted chicken turns out juicy and so flavorful with that garlic herb butter (the same one we use on our roasted turkey!). 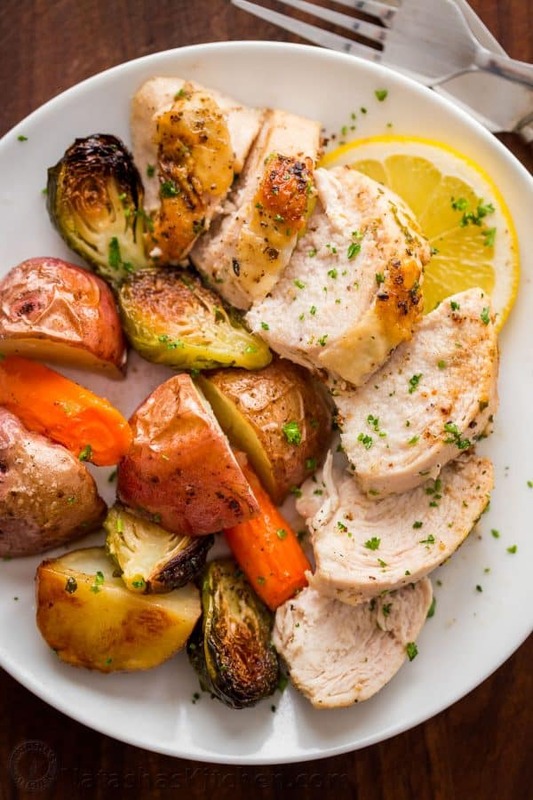 This one pan chicken dinner is easy and so delicious! There is no marinating or lengthy prep required. This is simple enough for a busy weeknight but it’s also a crowd-pleaser and perfect for company! 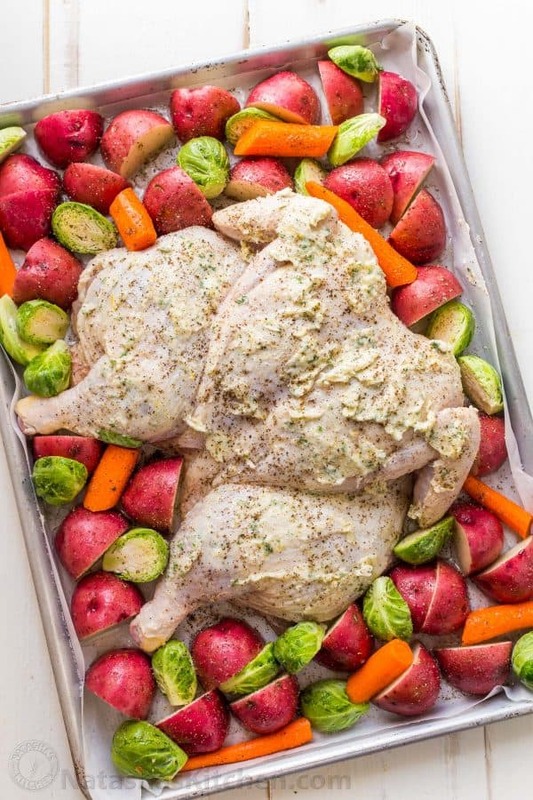 The potatoes, carrots and Brussels sprouts roast along with the chicken. This blend of vegetables bakes to perfection and every bite is supremely flavorful. The potatoes have a crisp salty skin with a creamy inside and these were some of the best tasting Brussels sprouts I’ve tried. 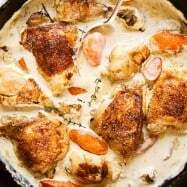 Watch the video on how to Spatchcock a Chicken and prepare this easy one-pan chicken dinner – one of our favorite whole chicken recipes! 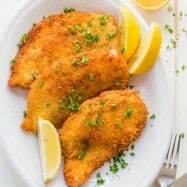 A whole roasted chicken can be tricky because the chicken breast can quickly dry out by the time the dark meat is cooked through, but when you butterfly a chicken (spatchcock), the chicken breast sits lower in the pan on the same level as the legs so it bakes more evenly and results in a juicy, moist and flavorful chicken. 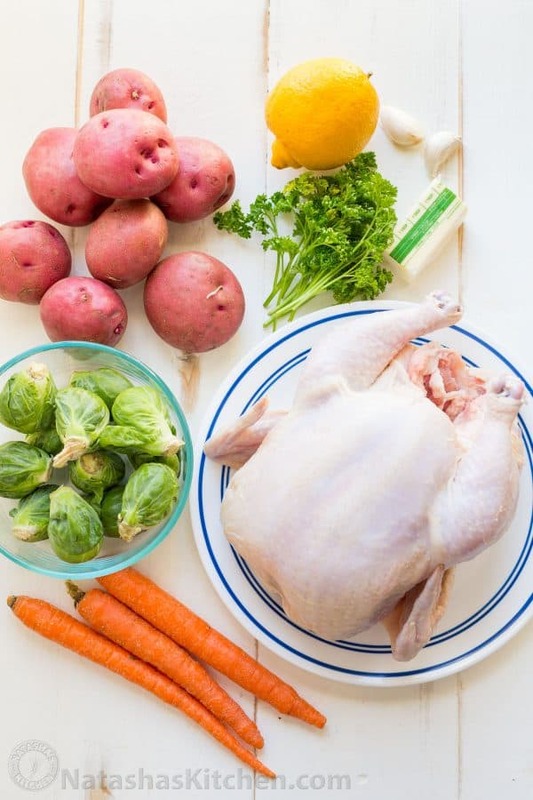 For this recipe, you will need a 4 to 4 1/2 lb whole chicken. Allow the raw chicken to sit at room temperature for 30 minutes before using for more even baking. The flavored butter is incredible and makes every bite memorable. We it in several of our recipes because it just works. See the full print-friendly list of ingredients in the recipe card below. 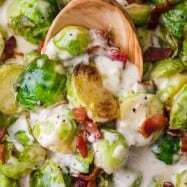 To make this a one-pan meal, we add potatoes, carrots and Brussels sprouts. Everything roasts together and you don’t have to toss or flip anything while it is roasting in that amazing flavored butter. 1. (Preheat Oven to 425˚F after step 4) Place chicken breast-side down with the wings/ neck facing towards you. Use kitchen shears to cut through the ribs right next to the spine on both sides to remove spine. ** Open the rib cage and use a heavy chefs knife to score down the sternum. This will help to pop out the breast bone and flatten the chicken. Season under the chicken with about 1/2 tsp salt and a pinch of black pepper. **Keep the spine and bones from the roasted chicken after it is carved and use them for the best homemade chicken bone broth! 2. 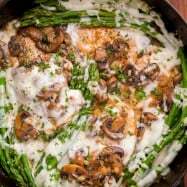 Flip the chicken over with the breast side up and place on a parchment-lined, rimmed baking half sheet. Using the palm of your hand, push firmly over the breast bone so the chicken lays completely flat. You want it to lay flat so all parts of the chicken bake evenly. Separate the skin from the meat over breast, thigh and drumstick areas. 3. 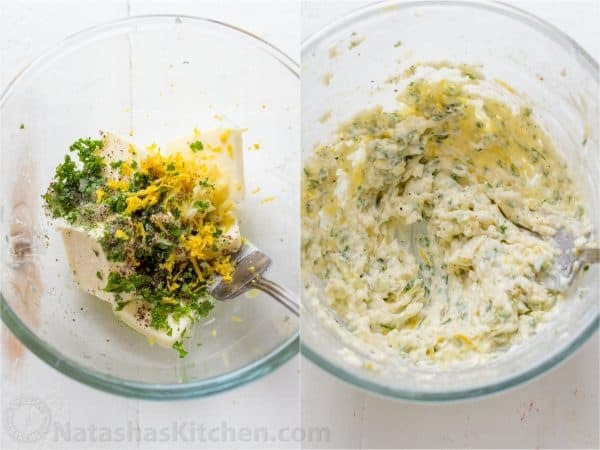 In a small mixing bowl, combine the flavored butter ingredients and mash together with a fork for a couple of minutes until most of the lemon juice is incorporated into the butter. 4. Spread 2/3 of it under the chicken skin and spread and dot remaining butter all over the chicken. 5. Place prepared vegetables all around the chicken then drizzle all over with olive oil and sprinkle generously with salt and some black pepper to taste. 6. Bake uncovered at 425˚F for 45 minutes or until instant read thermometer registers 160˚F when inserted into the thickest part of the chicken breast. Don’t over-bake or the breast will be dry. Keep in mind the temperature will rise another 5-10 degrees after it comes out of the oven. Remove form oven and rest uncovered 10 minutes on a cutting board before serving. 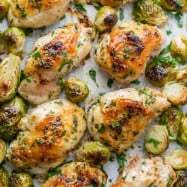 Here are some of the reader favorite chicken recipes on our blog. This Spatchcock Chicken recipe is our favorite way to roast a whole chicken. Every part of the roasted chicken turns out juicy and so flavorful with that garlic herb butter. This one pan chicken dinner is easy and so delicious! (Preheat oven to 425˚F after step 4). Place chicken breast-side down with the wings/ neck facing towards you. To remove the spine, use kitchen shears to cut through the ribs right next to the spine along both sides. Open rib cage and use a heavy knife to score down the sternum. This will help pop out the breast bone and flatten chicken. Season inside the chicken with 1/2 tsp salt and a pinch of black pepper. Flip the chicken over breast side up and set on parchment-lined, rimmed baking half sheet. Using the palm of your hand, push firmly over the breast bone forcing the chicken to lay completely flat. 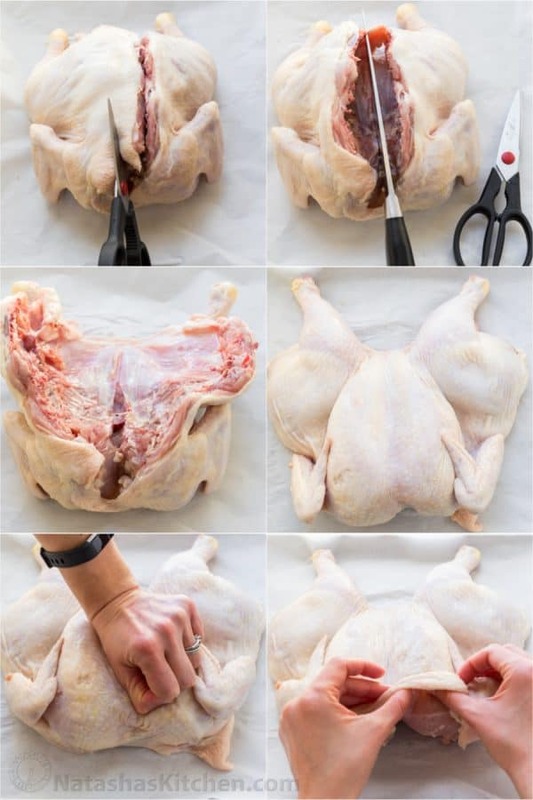 Use your thumbs to separate the skin from the meat over breast, thigh and drumstick areas. In a small mixing bowl, combine the flavored butter ingredients. Mash with fork for a couple of minutes until lemon juice is mostly incorporated into butter. Spread 2/3 of mixture under the chicken skin and and dot/spread remaining butter all over chicken. Place prepared vegetables all around the chicken and drizzle everything with olive oil. Sprinkle chicken and vegetables generously with salt and some black pepper to taste. Bake uncovered at 425˚F for 45 min or until instant read thermometer reads 160˚F when inserted into thickest part of chicken breast**. Remove form oven and rest uncovered 10 minutes on a cutting board before serving. *Allow the raw chicken to sit at room temp for 30 min before using for even baking. **Don't over-bake or the breast will be dry. Keep in mind internal temp will rise another 5-10 degrees after it comes out of oven. PS Placed black truffle butter (D’Artagnon.under skin of chicken with zest, etc. Tasty. My husband and my father-in-law were very impressed!!! My husband actually said that potatoes were even better than the chicken, that’s how delicious they were! I followed the recipe to the T but everything didn’t fit on one baking sheet (I guess I need to buy a bigger one!) so I used a second one for the veggies and then mixed everything together. 45 minutes was perfectly sufficient for a 4.70 lb chicken (I used a thermometer to check internal temperature). The veggies came out too charred for our liking- maybe I cut them too small- but chicken was awesome!!! So flavorful and moist . Absolutely delicious. Will definitely make it again – just without veggies next time 😁. Hello. Just wanted to say “AWESOME RECIPE”!!!! I used chicken thighs, and they came out very tasty and moist. Only one issue, though. I served it over linguine, and my family was fighting over the sauce. They all agreed. Next time, make double (or triple sauce). 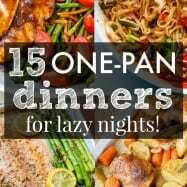 Love a one pan dinner and this one is a keeper! Chicken was moist and tender and the veggies were great! Hi. My chicken is going in the oven soon. It look amazing. Just sitting here enjoying my cup of tea after delicious dinner! Everyone in my family loved it! This chicken is absolutely The Best! Loved the veggies! Made this tonight and it is dynamite! !